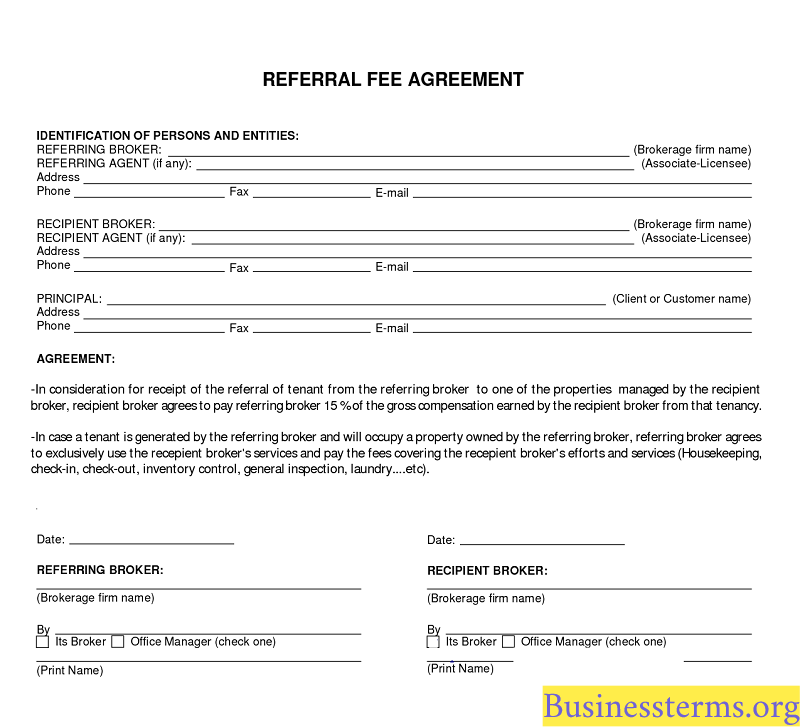 What is a Referral Fee? A referral fee is the sum of money charged from one agent to another for passing on a client. Often this fee occurs when a seller is leaving one area and their agent refers them to a broker in the interested area(s). It may seem contrary to common sense for an agent to refer their client but the reason is as simple as the client is moving to another neighborhood or state and the agent is unfamiliar with area. Or, that the agent deals primarily with residential properties and their client is looking to buy a commercial building. This document will contain details such as names addresses and license information – for both parties. The agreement should state who precisely made the recommendation as well as who is being referred. What is the Expected Standard Fee? Typically, the referral fee is a proportion of the final commission received by the agent who gets the referral. Once the sale is complete, the percentage received can range from 25% to 35%. The standard fee is around the 25% mark. In order to get the commission fee, the agent/broker has to be licensed. Importantly, at this point (when the agreement is drawn up) the percentage fee is determined. Also stated, would be how it is to be paid, the amount calculated and the due date of payment. Once the agreement is in place, the next step is to get client consent. The customer is the certainly the important part of the referral process. The agent has to ensure that they will use the referred agent otherwise they won’t get the fee! Clients can negotiate a referral fee. And the broker can accept a lesser remuneration, usually up to 5%. Reduction of fees can occur when/if the buying process is taking a little longer. In turn the agent/broker can demand a higher referral fee if factors such as a mortgage is already in place and the old home has been sold. Having to pay a referral fee can often increase the cost of real estate. Fees are generally only paid to a licensed agent. Many states forbid the payment of referral fees to unlicensed bodies. There are some states that allow unlicensed individuals to accept reimbursement for a referral on the sole condition that they are not part of the real estate transaction itself. When a client is referred to an agent they, in their own interest, should interview the agent. With a ‘traditional’ referral fee of 25% of the value of the sale being asked for, it is imperative to understand if the agent/broker can be of real help and what their qualifications they hold. Should a Referral Website be used? There is a growing trend in the real estate business for referral sites to be used. These online companies match clients with realtors and take a fee for this service. Whilst a niche market and may well be profitable, there are those who question the value of these sites. What is the value/reward ratio of a referral and how would it influence the services that the client receives? These sites are set-up to make a profit, of course. But, when the relationship is between client and against even two agents, the majority of the fee will go to the third-party site. The expansion of this niche market is limited. The referring agent isn’t doing a lot for the client. And, although a client is free to choose an agent (from the site), they know little about their business practices. So, what value is it for the customer? By using these sites, will they get an experienced and effective agent? It’s argued that it’s doubtful that this will happen. It is easy to see that the best agents will be very busy and those less experienced or not giving their all will be available but the service is lacking. These referral sites give an indication of a lot of money in play for the services that they are delivering. Using these sites should be taken seriously as the client will not know the trustworthiness of the agent/broker they are being referred to or their qualifications. Finding clients and listings can be a trial and all listings in real estate are carefully controlled. Each state has their own set of rules regarding the buying and selling of real estate and regardless of an agent’s referral, they cannot expect to get the fee if they don’t adhere to regulations. Overall, referral fees are useful in helping build a business. Although it can be an unknown concept to the client selling or buying a property, it’s important to remember that a referral fee agent to agent is the accepted norm as often the referring agent knows it’s a good match for their client. Joe Bloggs wants to sell his home in Massachusetts and move to New York. His agent (Broker A) knows a broker (B) in the Manhattan area and refers Joe. Broker A refers Joe to Broker B in Manhattan with a written referral agreement, detailing a certain percentage of the final commission earned by Brokerage B.
Let’s assume the gross commission would be approximately $15,000. The agreed referral fee is 25%. Broker B’s agent and broker would split the remaining $11,250. 1. What is the typical percentage of a referral fee usually asked for? 2. What is the main reason for a referral fee? C. It’s a legal requirement. 3. Is client approval necessary to get a referral fee?